Residents in a long term care setting often face complex social, medical and emotional problems. Their families and the direct care staff are also confronted with these challenges when caring for them. 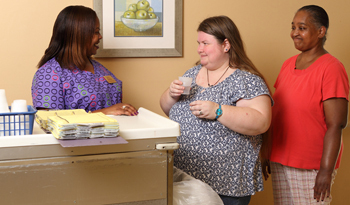 At Decatur Manor Healthcare, a clinical team provides assessments and ongoing services for residents according to their unique needs, including medication management and supportive therapies. Residents are ensured Medication is available and taken correctly. This service alone greatly reduces the need for hospital admissions. Individuals with Mental Illness often miss medications when living in community settings; they often do not get medications refilled and/or convince themselves that they no longer need them. Decatur Manor Healthcare offers comprehensive medical and psychiatric services including regular physician and psychiatrist visits. Other medical services are also available and scheduled either at our facility or coordinated for the resident as needed. The team provides families with tools and the critical knowledge needed for handling the challenging mental and physical health issues and the associated behaviors of their loved ones. Decatur Manor Healthcare manages each resident’s treatment and continuity of care according to their individual needs. Our professional staff meets regularly and reviews individual goals to assure successful community living.